I have loved Ronie Kendig’s writings after reading her Discarded Heroes series (click on the name to see my review). I had been wanting to read Trinity for awhile and finally had my chance. This is an intense romantic suspense. Ronie is a master at understated romance. 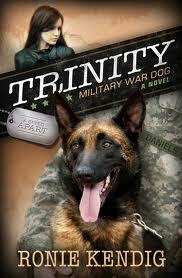 I love the romance between Heath and Jia/Darcy and how Trinity, the dog, seemed to keep bringing them together. I don’t want to give away the plot or any of the surprises but there are some sweet moments woven into the tension of the war that the characters are involved in. Heath was a Green Beret until he was injured and left with a traumatic brain injury. His dog refused to work with anyone else so both were dumped from service. Pulled into a moral boosting training program called A Breed Apart, Heath has to struggle to swallow his pride at the lost dreams. Heading oversees to a military base and running into the unit he used to be an integral part of only rubbed salt in the wound. He meets Jia and something seems familiar with her and he is instantly attracted to the elusive woman he nicknames “Rock Girl.” She ends up being so much more — the focus of his future as well as a ghost from his past. I have great respect for Ronie’s deep research of the military, the way they work and the role of the often unsung canine warriors who put their lives on the line to keep others safe. Again – another wounded warrior here is finding a place to be useful once again and is willing to lay his life on the line for others. Heart-stopping action, well written and the ending left me with a smile on my face for a long time. I look forward to reading the rest of this series.